I'm actually going with the 27mm ones and modifying them like surferpkt showed in post #57. I really like the way those are looking. One thing I've noticed between the 27mm and 31mm Harley ShAkeRsOn needles is that the 27mm hat is roughly ~2mm smaller in diameter than that of the 31mm hat diameter. You don't really notice it unless you hold them up to one another and see the the smaller ends at the bevel of the larger hat. Also the shaft of the 27mm one is longer than that of the 31mm. I'll have to get the measurements when I cut them down to size as both will need to be cut down and ever so slightly drilled out for a snug fit that is not overly tight. I just want to say that the Harley needles aren't really plug and play with these clusters. You have to drill them out a bit in order for them to slip on. Both of mine were extremely tight. I ended up drilling one of them too large and now I have to buy another needle. I also noticed that the guy on ebay no longer takes offers so you have to buy them at $18 a piece...another facepalm. Anyways, have anyone tried these drill bits? Seems like they have pretty good reviews...anyone know what the color rings are for? Is it so that you can grip it for hand drilling? Looks like only the 27mm Harley needles still have best offer option, but not the 31mm ones. FWIW, if you need to drill anyway, you can most likely fill the hole with epoxy and re-drill to the correct diameter.. I have a couple that I drilled with the wrong drill bit before I realized what I was doing, and will be attempting that. As for those drill bits - unless you have a very good drill press or a CNC machine, you don't want to use carbide. They're VERY sharp, but VERY brittle. Any mis-alignment / bending forces at all, and they snap like twigs (and break off in what you were drilling). The colored rings are for easier identification of sizes, and to be used as a depth-stop in the PCB milling machine. You pre-set the depth with a depth-setter, then you just put the bit in up to the ring and you don't have to re-calibrate for zero for each bit. I use them with my CNC machine all the time..
has anyone else tried any other needles? just wondering if there are more options out there. 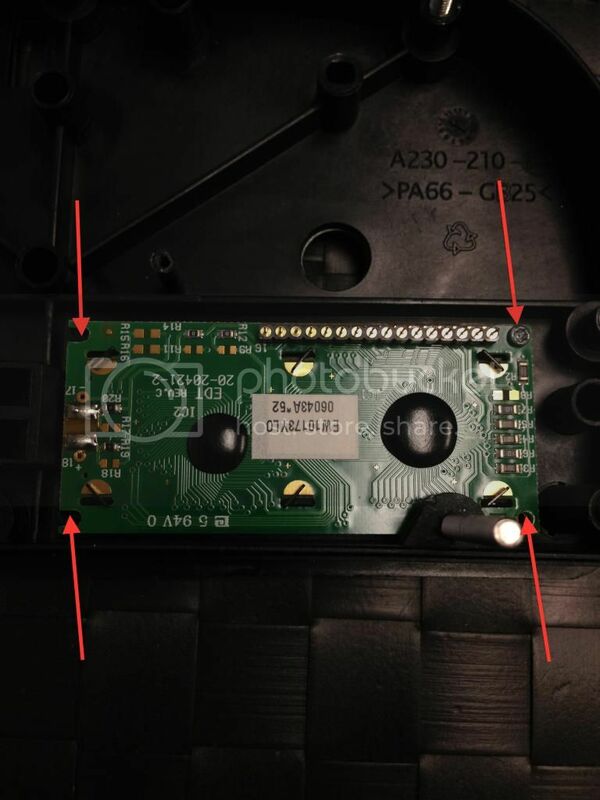 updated with info on white EL panel. thank you Bob (Riceburner98)! 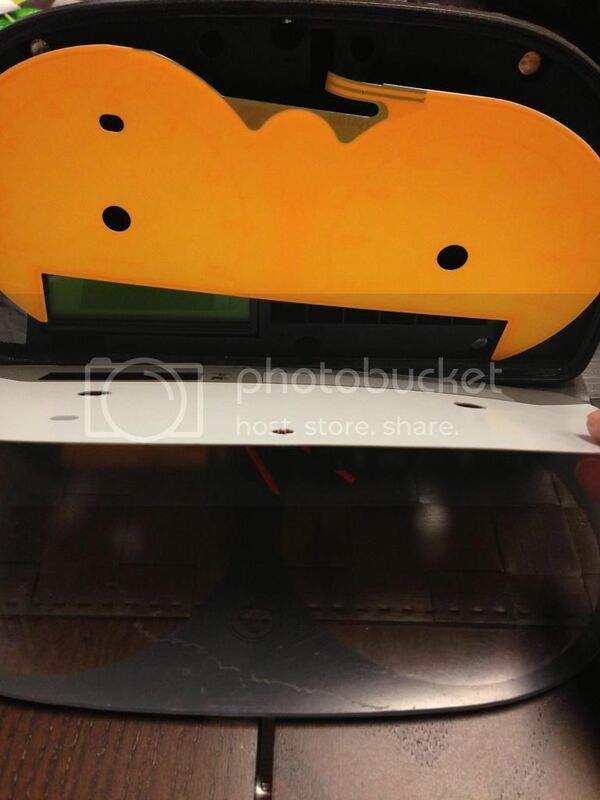 I've received lots of questions regarding how to do the needle/ LCD display mod. There's a thread a while back that was started by riceburner, aka Bob. He contributes a lot of time and effort to make this happen. I have to give him tons of credit for it. In this thread, I will briefly go thru the modification for those who don't have time to go thru 20 pages worth of information. But again, credit to those people who participated there, they are the ones who came up with these precious information. I'm not an engineering nor a handy guy, so if I can do this, i believe everyone can do it. before you start anything, make sure to wear a pair of gloves to prevent shorting anything in the circuit board. b. pull the needles out "gently"
c. remove the plastic needle trims and the outer plastic trim "gently"
g. at this moment you really have to have your gloves on so you don't short the board you are about to see. 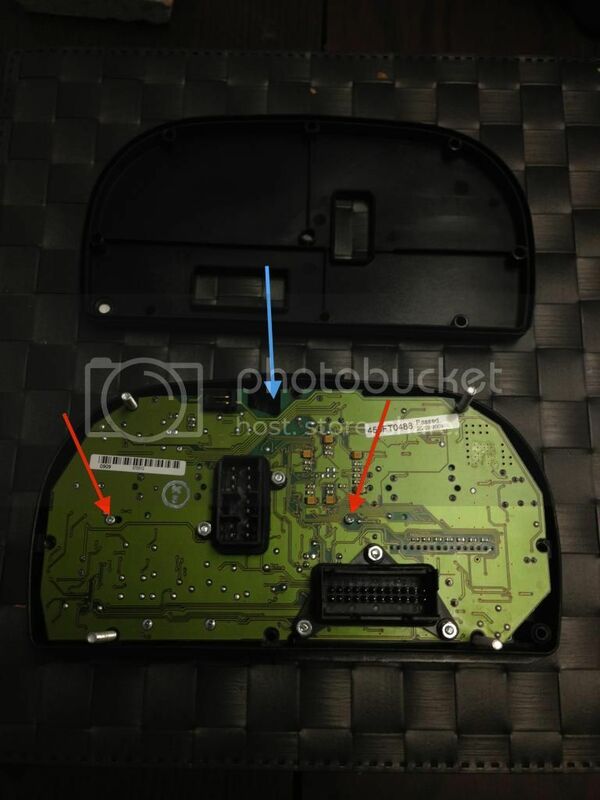 1. try to plug the board back to the car and see if the LED and LCD work first before you put everything back. It'd be frustrating to find out something doesn't sit right and you'll have to remove all these bolts and screws all over again. 2. always wear gloves, if you short something, you are screwed. 3. soldering can be difficult for the first timers like me, find someone who can solder to solder the LED ring for you if you are not confident doing it. now put everything back and enjoy the new look of your 10 year old clusters! 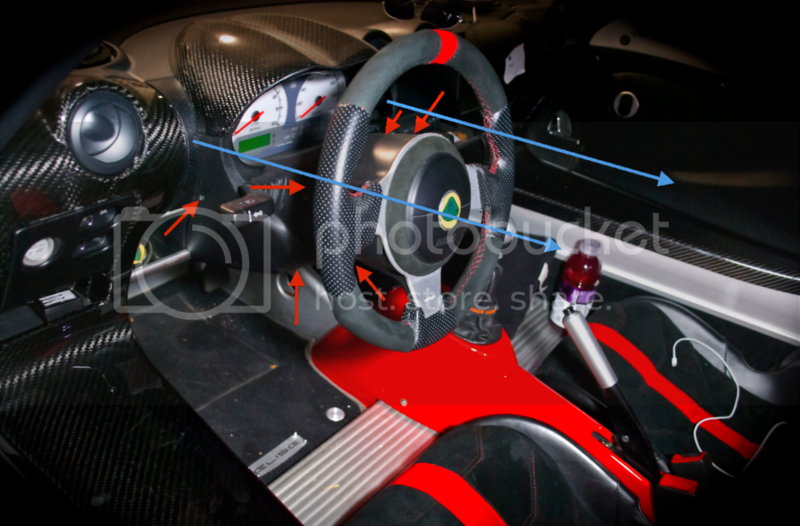 Personally, I think #4 is the closest or most identical to what Lotus use in 2008+ Elise/Exige clusters. Almost to the point to button it all back up now but had hopefully a quick question for you guys. How exactly are you connecting the plexi and aluminum/carbon surround? I was thinking maybe just a little super glue but wasn't sure if that was really the best tool for the job. Use a hot glue gun and run a bead around the edge. It will hold fine yet allow you to take it apart in the future if needed. Weld-bond, Tacky Glue or silicone should work as well. 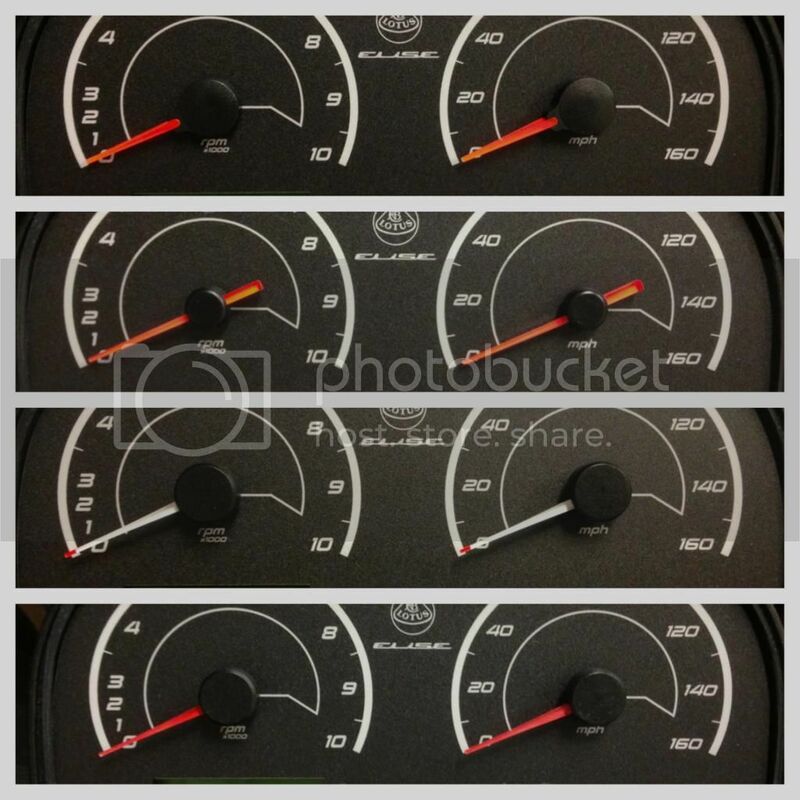 The tach needle works just fine but the speedo needle doesn't move at all. I did have the original issue of the pin getting pulled all the way out when taking the original off. So previously it did spin 360 degrees. I followed the guide on how to put it back together and I can now only spin it about 320 degrees and I can hear the gear spin inside. But when in the car and driving around it does not move at all. 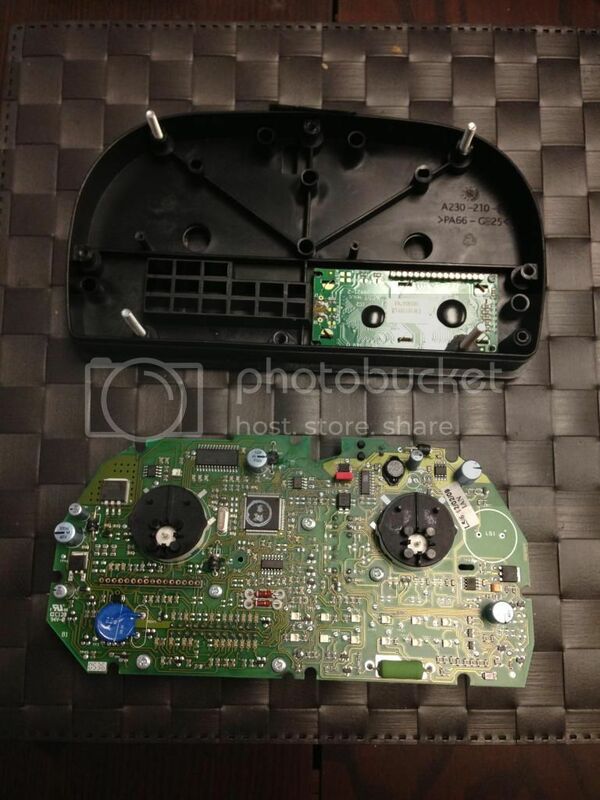 I have pulled it all back apart again to verify it is correct and seems to be to me. 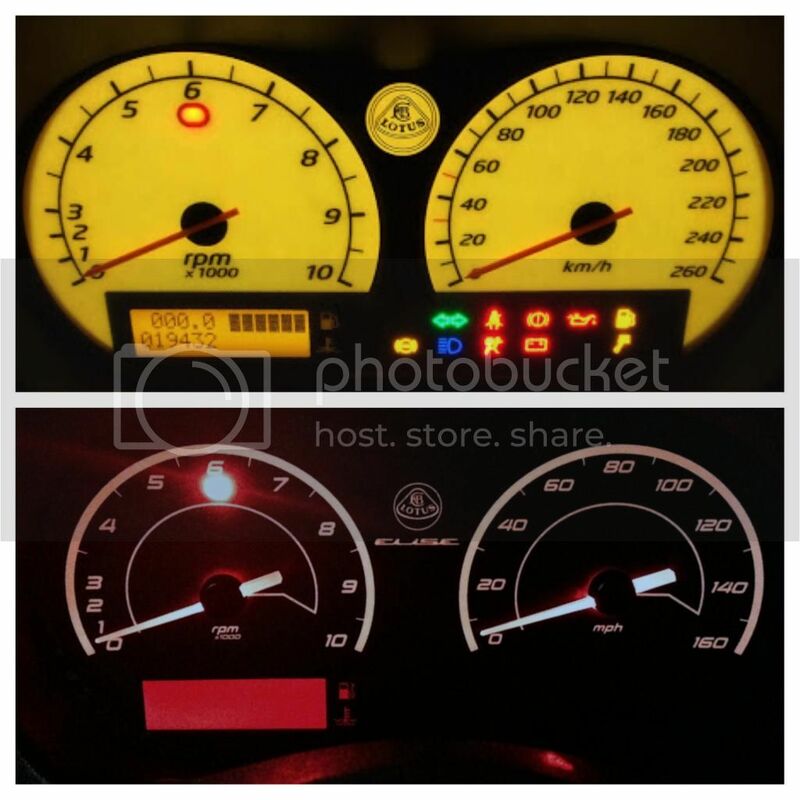 I do notice that the tach needle is about half as easy to move compared to the speedo needle but not sure what I could do to fix the speedo needle. Anybody else have any sort of issue like this? Or does anyone have any thoughts for me to help troubleshoot this? Im afraid I have either shorted something or completely screwed up the stepper motor. 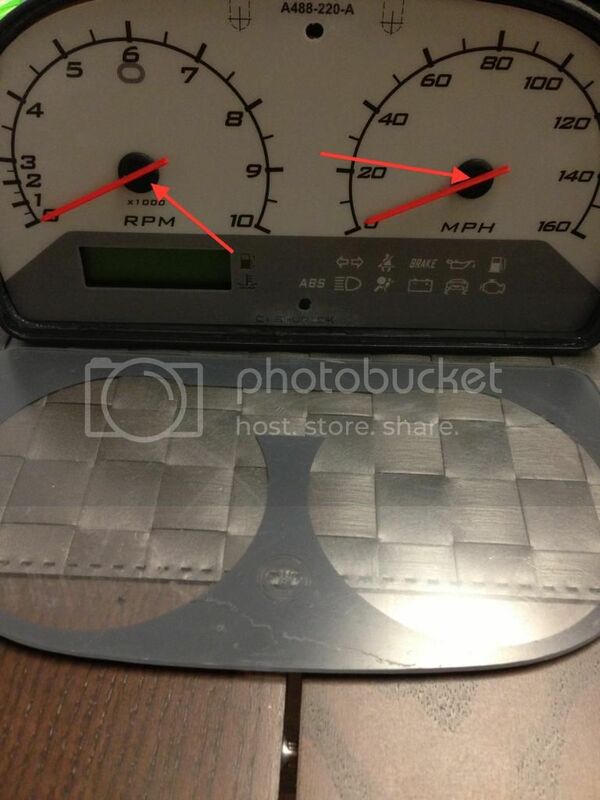 I have the same issue, after getting the speedo needle seated properly I had to widen the white plastic over the motor, however doing that allowed for a lot of play. Because of that the needle was now hitting the plexiglass screen, preventing it from moving. 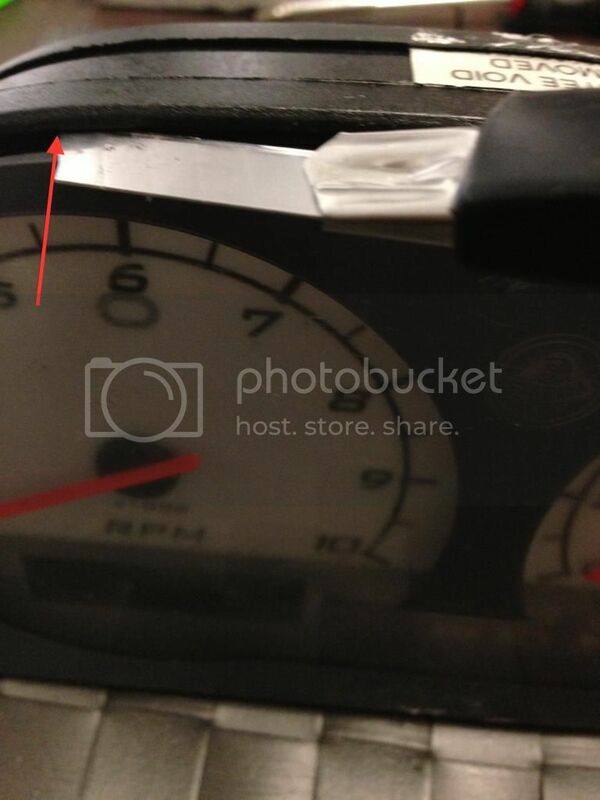 I suggest taking off the upper dash cover and removing the plexiglass screen. If the needles work then there's your problem. You might need to space it out a little further to give the needles some space. So I know its not the plexiglass hitting the needle since during the test drive I did not have it on :/ thanks for the idea though. Oh, that's not good.. 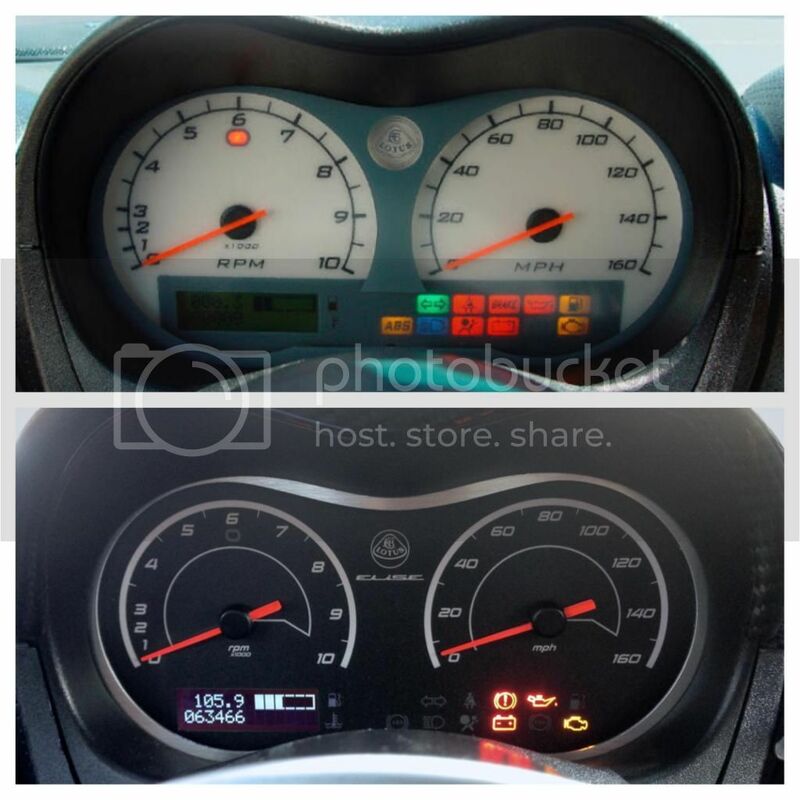 If the speedo needle feels harder to turn, most likely it's still a mechanical issue. I think it's fairly hard to blow up just the portion of the circuit that drives 1 motor without causing other electrical issues. 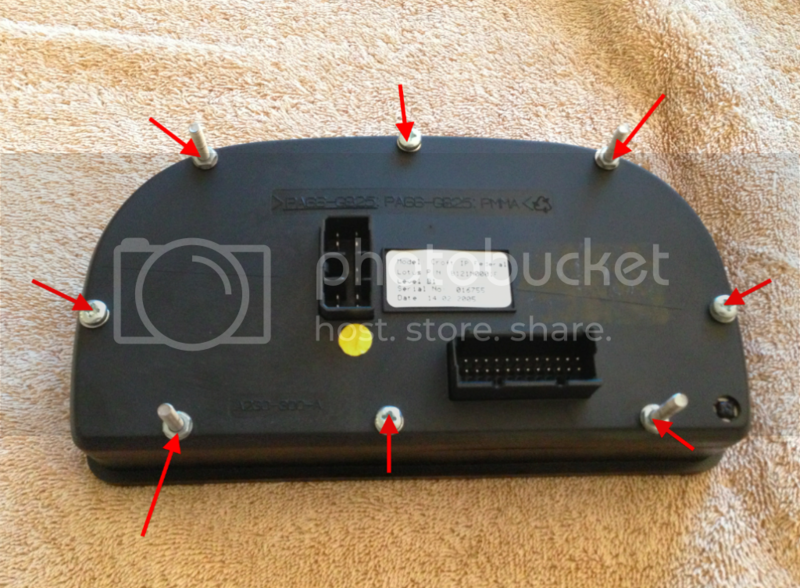 Did you completely disassemble the speedo needle motor to get the pin back in? The gear teeth are super tiny and unfortunately pretty easy to damage if not assembled perfectly.. It's possible maybe one of the little gears isn't seated 'just right' inside there? If you do end up pulling the motor apart again, you could power it up with it pulled apart and make sure the tiniest gear on the motor part does actually turn (and isn't stuck but still making motor sounds), then carefully add each gear back to see if they still turn correctly? Worse-case the whole motor itself can be replaced with very careful un-soldering of the 4 pins that hold it on the circuit board. I've replaced a couple now; the replacement motors are on eBay or I have a few that I bought just in case. The new design of them is supposedly better, but they function the same. If you can't get it working again, and if you don't want to / can't replace the motor I'll offer to do it for just the cost of the motor and shipping. I think they were around $5 - I used the "X27" motor, and just clip off the extra locator tab / bumps on the back. So I've pulled it apart about 6 times now trying to get it to seat right but every time it comes out feeling exactly the same. I have attached pictures of the gears and the order I am putting them back in and there appears to be no teeth broken and based on this pdf I believe I have all the gears and pins where they need to be. I have also attached a video of the needles and motors back together to show how the speedo is slightly harder to move with the same force and that it sounds slightly different when moving. So the next question I have is is there an easy way for me to get that motor to spin without driving the car around. Its getting cold and salt will be here soon so driving the car won't be an option much longer. Hooking a power supply would work just would need to know where exactly. Or if the car has a reset feature or something that would cause the needles to move. I mean I have the spec sheet for the motor so I'm sure I could figure it out but would take me a little while to dust off my electrical engineering skills. I ran into this problem too when I was working at my friend's cluster. This thread here is very useful for issues like this. Ok so I've done a little "bench modeling" with the two Newhaven LCD modules I have - one with red and one with white backlighting. I soldered the DigiPak header pins onto both modules and used a Netduino HD44780 controller library (and "Hello World" program) I had handy. It shows the milliseconds since power up on the second line. I also pieced together the new EL panel, new gauge panel and red painted Harley needles with red LED rings to complete the simulation. Which color do you guys think looks better?